Super bright SMD 5050 RGB color changable LED with 24KEY RGB IR remote control. 20 different colours -Red, Green, Blue, Yellow, Pink, Purple, White ... including fade & strobe. Water resistant flexible LED strip, great for decorating indoors and outdoors. Customize DIY decoration for TV or PC monitor background lighting. This Bias lighting kit can really help to improve your perception of contrast, and make panel monitors much easier on the eyes to reduce eye fatigue, ease eye strain. Also can use for decorating ceiling, cupboard, kitchen, living room, hotel room, etc. Just plug and play, powered by 5V USB port, can connect to TV, PC, powerbank, car cigar lighter, etc. 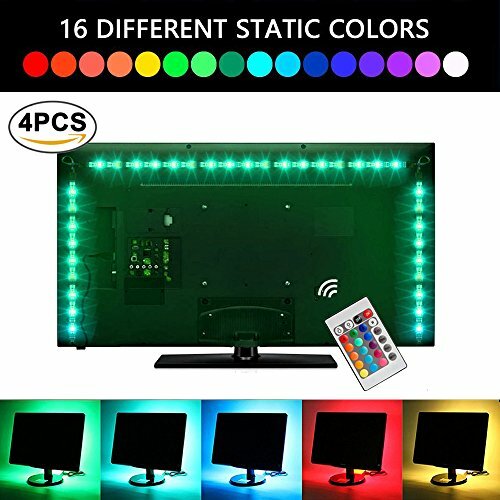 Complete kit: 4pcs 1.64ft led strips, 3pcs light strip connectors, 1pc 24key remote controller (battery included), 1pc LED controller with USB interface. These lights come with a 12 month warranty. If you received broken or defective lights, please contact us any time. Relieves Eye Strain: TV Backlight helps reduce the eye strain caused by long exposures to TV screens and monitors in dark rooms and creates a comfortable bias lighting when watching TV or playing games. 16 colors and 4 dynamic modes: LED TV backlight, dimmable. You can use the remote control change the color, the brightness as well as different lighting modes. Control distance is 8-10m. Easy Installation: Just plug-and-play. We use upgraded super sticky 3M adhesive for this led light strip to provide secure and strong installation without worrying about falling off. Driven by any device with output 5V USB port, such as TV, computer, desktop, laptop, tablet, Tab, car cigarette lighter,etc. Safe and Wide Application: 5V 5050 RGB LED backlight strip features low power consumption and extremely low heat. It is touchable and safe to children. Perfectly used for boutique lighting, stairs lighting, makeup mirror, wine cabinet decoration, Christmas, Halloween, festival lighting decoration, clubs, and other indoor decoration.